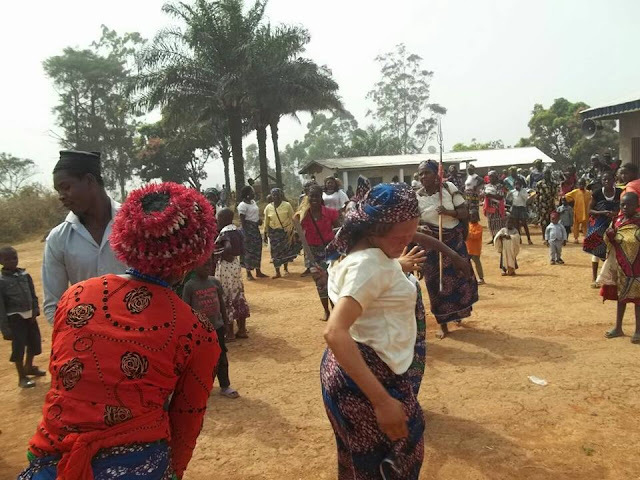 There was euphoria and fanfare in Bongom village on December 27 and 28 respectively. This year's cultural fiesta pull thousands as gathered at the community hall to express themselves in songs, dance, speeches and to portray their cultural values. The most interesting aspect was the football tournament (male and female) which was sponsored by Fon Abdu Bemsi. It is worth mentioning that Bemsi disbursed over FCFA 1 million to ensure that every aspect of the cultural festivities were well planned. Speaking at the cultural week, HRH Fon Nformi Nfor of Bongom expressed gratitude to the lone sponsor for his laudable initiatives for foster the development of the village. 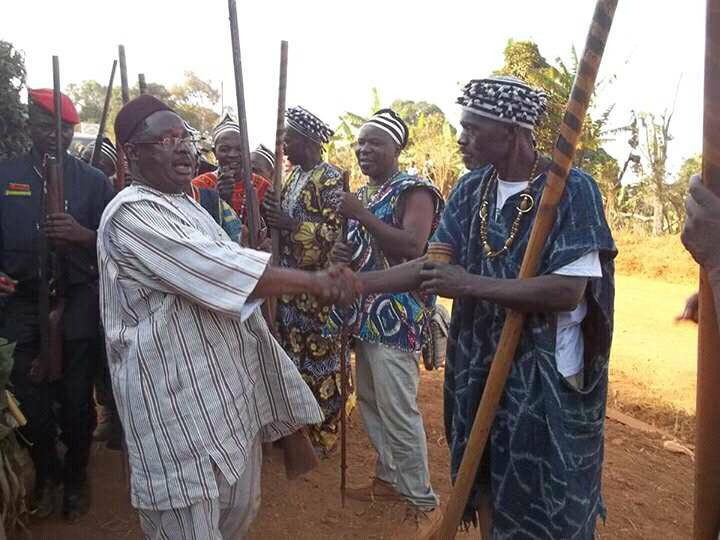 Fon Nformi Nfor also used the opportunity to call on Bongom elite(s) to emulate the good example of Abdu Bemsi who as distinguished self as a development luminary. He called on the population to live in peace, harmony and should be united in their efforts to develop the village. From Njang, Toh, and other royal dances, those who could not express themselves in speeches did it in songs and dance. By 3 pm, the sound of the drums and gong echoed on the level lands of River Mbiih, up to the hills of Njap, Chup and down to Kiih ( the land of the ancestors). Euphoria reached at it peak when the female finals was announced. 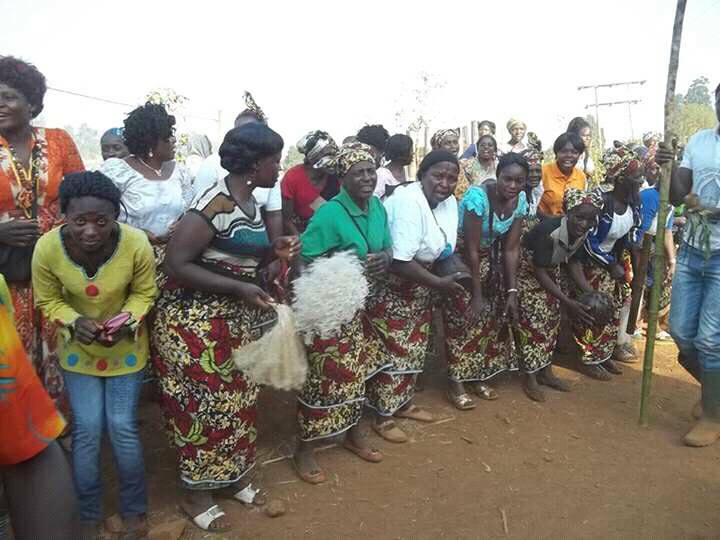 The Ngwagus (married women) clashed with the young girls as hundreds gathered to cheer up their respective teams. At the end of the day, the Ngwagus lost to young girls (unmarried) by one goal to zero. It should be recalled that the male and female tournament was sponsored to the tune of over FCFA 500.000 excluding FCFA 300.000 earlier disbursed by the sponsor to enable the teams prepare for the finals. 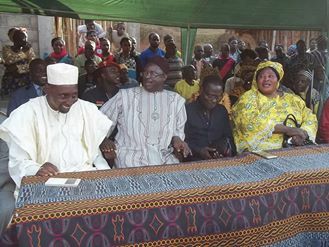 Youths of Bongom through Chifu Bungong lauded Abdu Bemsi for his laudable initiative to promote young talents and culture. To, Chifu Bungong, Bemsi is a development luminary whose efforts are appreciated by every one. "Tantoh Binka" Hon. 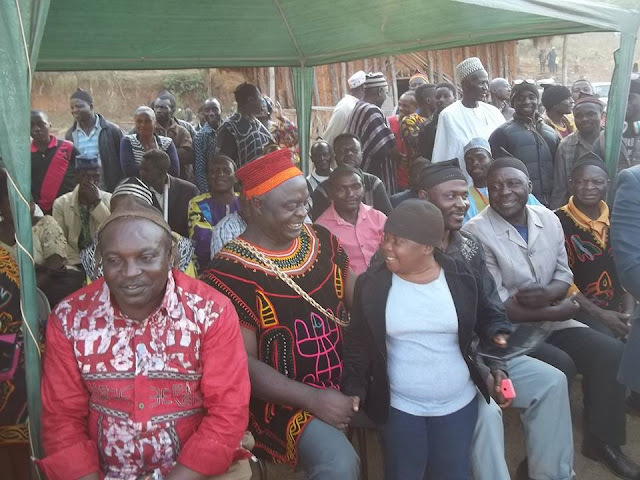 Awudu Mbaya on December 30, paid his last respect to the departed heroine and hero (rulers) of the Binka people in Donga Mantung Division in the North West Region. In the Mbum tradition, a traditional ruler never dies, he or she disappears. On December 30, it was Hon. Awudu own reception at day at the Bfu Bfu celebrations in Binka. 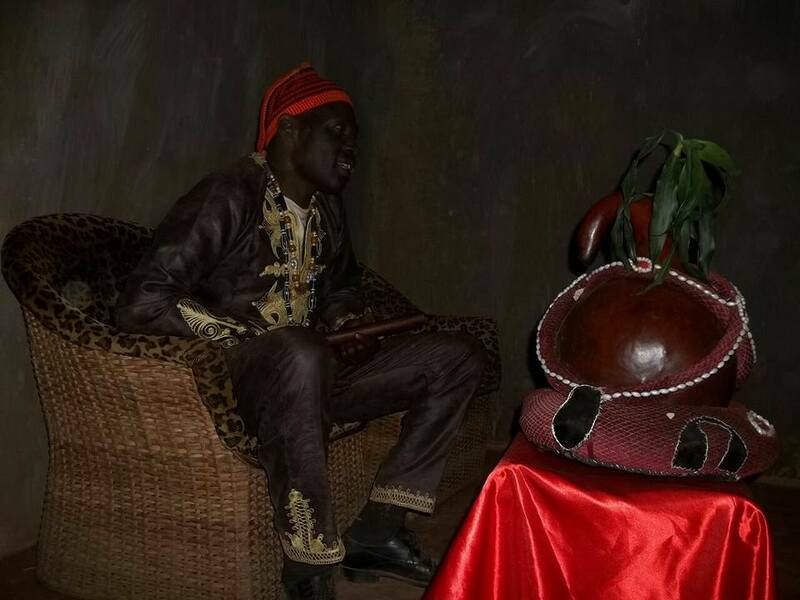 His own reception was different and extraordinary given that he is a senior Tantoh of Binka palace since 1997. 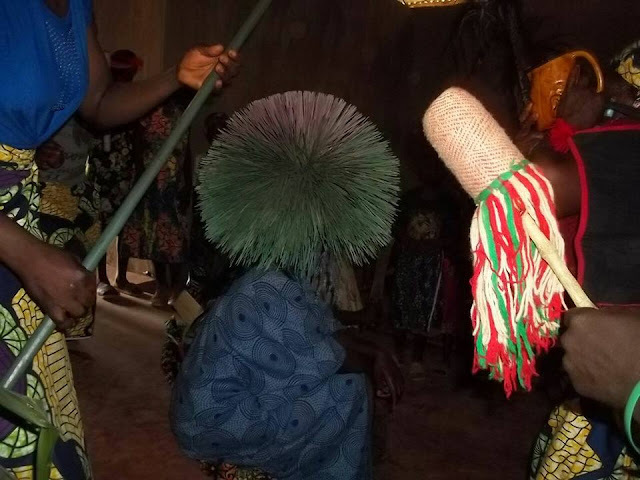 Masquerades displayed, singing, dancing and gun firing was the order of the event which was strictly in line with the Wimbum tradition. Worthy to note that on the day of the official opening of the funeral celebration, Hon. Awudu Mbaya was present to pay own homage to Ma Yaah Ntobo and the late fon who was also inseminated per the the Wimbum customs and tradition. 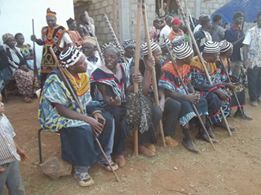 It should be noted that the funeral celebration also gave the King of Binka, HRM King Benchep Adamu, traditional council as well as village development association the opportunity to review and eradicate some obnoxious traditional practices that have been dehumanizing and or have stood as hindrances to development. During the official opening of the funeral celebration the fon announced that instead of 21 days that people usually stay home to celebrate the departure of a Queen Mother or Fon, the number of days have been reduced to 10. He also said that in the past women used to move bear bodies, but now, women will have to wear their dresses and both the men and women will only stay without caps for three days. On the number of country Sundays, (days people dont work) he said they have been harmonized. From four country Sundays, only one day is reserved as country Sunday. He explained that these days have been hindering development of the village given that each week, the population spend close to four days or five out of seven at home. Hon. Awudu Mbaya applauded the people of Binka for the wise decision. He said those practices that are so harsh should be redressed. He recalled how his first micro project grant was used for the construction of the Binka Palace Green House, beside many other initiatives as was testified by the fon. Leader of Boko Haram - Nigeria's terrorist group, Abubakar Shekau, has appeared in a new video on Thursday and slammed the nation's President. In a new video releases on Thursday, December 29, the elusive leader of Boko Haram, Abubakar Shekau, was seen disputing a claim by President Muhammadu Buhari that the jihadist group had been routed from its Sambisa Forest stronghold. While referring to Nigerian President, Muhammadu Buhari who said on Christmas Eve that the extremist group had been defeated and driven away from the forest, its last known bastion, Shekau said; "You should not be telling lies to the people. “If you indeed crushed us, how can you see me like this? How many times have you killed us in your bogus death?” he asked. It was not immediately clear where the new video was shot, but Shekau who spoke in both Hausa and Arabic said it was filmed on Christmas Day. Shekau last appeared in a video in September where he disputed a claim by the Nigerian military that he had been wounded in battle. He vowed to continue fighting on until an Islamic state was imposed in northern Nigeria. The U.S has sanctioned Russia over alleged interference of Russian hackers in the recently concluded election to give Donald Trump an edge. "These actions follow repeated private and public warnings that we have issued to the Russian government, and are a necessary and appropriate response to efforts to harm U.S. interests in violation of established international norms of behavior," Obama said in a statement from Hawaii, where he is on vacation. "All Americans should be alarmed by Russia’s actions," he said. “It's time for our country to move on to bigger and better things," Trump said in a statement. "Nevertheless, in the interest of our country and its great people, I will meet with leaders of the intelligence community next week in order to be updated on the facts of this situation," he said, without mentioning Russia. The Kremlin, which denounced the sanctions as unlawful and promised "adequate" retaliation, questioned whether Trump approved of the new sanctions. Moscow denies the hacking allegations. Republican and Democratic lawmakers have voiced concern about Russia's actions, setting up a potential wall of opposition should Trump seek to overturn Obama's measures. It has been argued that he accepted Biya’s invitation, and that he has hardly come out in a clear-cut manner in support of the “Anglophone cause”. Visiting Biya seems to be more of a mark of statesmanship; and a core value of the believer. Every step that does promote dialogue through human interaction is consistent with preventive diplomacy. And if our Lord mixed and mingled with sinners, why should his followers conduct themselves otherwise? 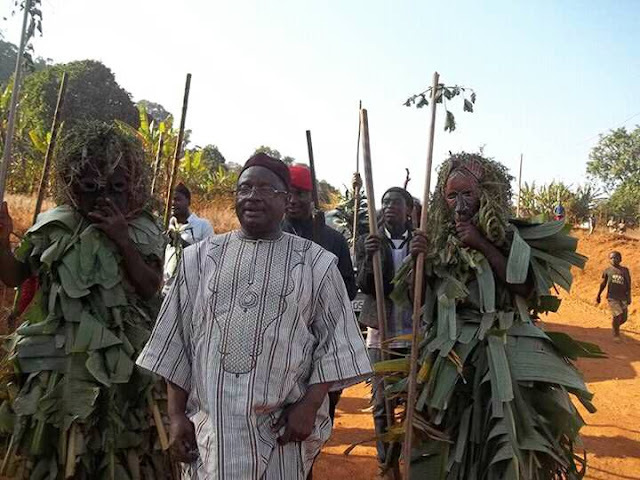 All in all, Ni John Fru Ndi has made his mark; and his remaining the head of the party beyond some persons’ sense of tolerance would do little to overshadow the largely positive character of a man daring to the brink of audacity. 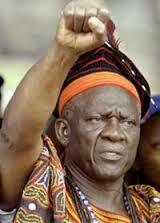 One would daresay “Ni john Fru Ndi, thy name is endurance”! More details have emerged about the Nigerian pastor who was rejected by his own Church members after he disguised as a haggard beggar during a Christmas service. The Senior Pastor of The Kings Heritage Church, Lawrence Onochie disguised himself as a beggar to the Church he pastors as a way of giving practical lessons about the essence of Christmas celebrations which has been miscontrued to be a period of 'rice and chicken' bazaar. After he was rejected by his unsuspecting Church members, he unveiled his identity and lectured them on embracing the poor and filthy during the Yuletide. His story went viral on internet after a female Church member shared it on Instragram. Mr. Onochie has now taken the pains of cashing on the current media attention beamed on him to educate the general public about the cogent message and lesson behind his action. 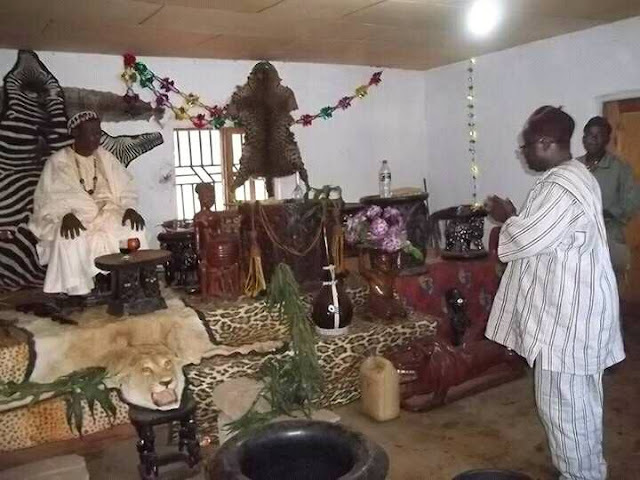 His fresh article as released on Facebook concerning the odd Church incident is titled "Pastor Disguised As a Beggar – The Real Story and Lessons by Pastor Lawrence Onochie"
Hebrews 13:1-3 (AMP) 1 LET LOVE for your fellow believers continue and be a fixed practice with you [never let it fail]. 2 Do not forget or neglect or refuse to extend hospitality to strangers [in the brotherhood - being friendly, cordial, and gracious, sharing the comforts of your home and doing your part generously], for through it some have entertained angels without knowing it. 3 Remember those who are in prison as if you were their fellow prisoner, and those who are ill-treated, since you also are liable to bodily sufferings. I grew up in a family where taking care of strangers was like an obsession for my parents, they sheltered countless number of people who they knew little or absolutely nothing about. I walked into a bank one day and the lady who was attending to me kept smiling, she was very cordial and helpful. When she was done with me she introduced herself as one of the people who had lived in our home several years back when she was homeless. I had similar experiences a number of times, thanks to God for giving me the opportunity of growing up in such a home. At THE KING’S HERITAGE we have provided shelter for countless number of people over the years who didn’t have a home some of them we didn’t know from anywhere. The most recent is a young man who came to church several weeks back, his home for many years has been a car garage and had been subject to abuse. To keep body and soul together sometimes he would go as far as removing car stereos to sell, in fact he had one in his bag the day he came to see me. A week later he was staying in the church office and eventually we got him a job. We have had a feed the needy program where we provided raw food for hundreds of families in the community regardless of their religious persuasion. However at 1am on Sunday (December 25th, 2016) while I was preparing for the Christmas service I felt inspired to disguise myself to church as a beggar and enter the real world of the needy, the derelicts, and the destitute. Through the help of the head of our production unit I achieved that, I was transformed and I entered the church without being recognized not even by my wife. I sat in the congregation and followed through with the service. Yes they were some with hearts of gold who came and at least gave me a handshake when the pastors asked the congregation to welcome each other. But they were also some who carefully avoided me, they were some who were not so discreet about it they made it clear they didn’t want to come near. Although I was acting a part, but I could literarily feel the pain of rejection when some walked past me to greet others with an attitude of ‘you don’t matter’. Of course as expected when one of the pastors came to encourage the congregation to invite someone they didn’t know over to their homes for Lunch, not surprisingly no one came to me except for one or two who at this time already knew what was happening. That can be excused to a great extent because of the state of insecurity in the country and the potential risk involved in such demonstration of love. However they’re ways to go around such potential challenges of being hospitable if our hearts are truly keen on it. At the pick of it, I went up stage and revealed my Identity and shared my experience, I couldn’t hold back tears. I saw some wiping off tears from their eyes as I spoke, at the end of the service there was an atmosphere of genuine repentance and commitment to a life of practical demonstration of selfless Love. 1. The summary of the whole experience is to let us know that EVERYONE matters to God, rich or poor, stranger or family, beggar or wealthy, destitute or celebrity – EVERYONE matters to God. Jesus said “35 'for I was hungry and you gave Me food; I was thirsty and you gave Me drink; I was a stranger and you took Me in; 36 'I was Unclad and you clothed Me; I was sick and you visited Me; I was in prison and you came to Me...40 And the King shall answer and say unto them, Verily I say unto you, Inasmuch as ye have done it unto one of the least of these my brethren, ye have done it unto me. (Matthew 25). What we do to the ‘least’ matters so much to God. 3. I learnt that sometimes the people who need love the most often deserve it the least. Sometimes they look dirty, they look tough and mean, sometimes they even look rich and happy but they’re dying for love and affection within. Don’t discriminate – spread God’s kind of love. 4. Reality sometimes is not what it appears to be. As Pastors it’s easy to assume that what’s happening on the platform is exactly what’s happening in the pew. Reality is that sometimes the difference can be as far as the North is to the South. If you had asked me before this experience I probably would tell you that this may happen in other churches but not ours based on my perception. 5. Some of the people who despised me the most were not the rich and mighty, some of them are from very humble background. So it’s a myth to assume that looking down on people is exclusive to the high and mighty, the reality is sometimes it’s more from those who are still struggling with poverty. They tend to project the inferiority they feel on others, they see in others what they think of themselves and they despise it. 6. I realised that as a leader the best way to judge people is not necessarily by how they treat me but by how they treat those who are seemingly less than they are. Everyone can treat a leader right. 7. I also saw a common weakness among human beings; we go out of our way to be nice to those we think we can benefit from and ignore those we assume we can’t derive benefits from. If I appeared as the Pastor and sat at the same spot everyone would gravitated towards me. 8. It doesn’t matter how powerful your message is as a Pastor some will not reflect it. Despite all the beautiful messages Judas heard from Jesus he didn’t exemplify the message, he was never changed. 9. Class-consciousness is not of God, it is not the nature of God. If you occupy an esteemed position it’s not just a function of your hard work for many have worked harder but have not achieved it. It is a function of the grace of God, He ensured that you were in the right place, at the right, time, and you met the right people. 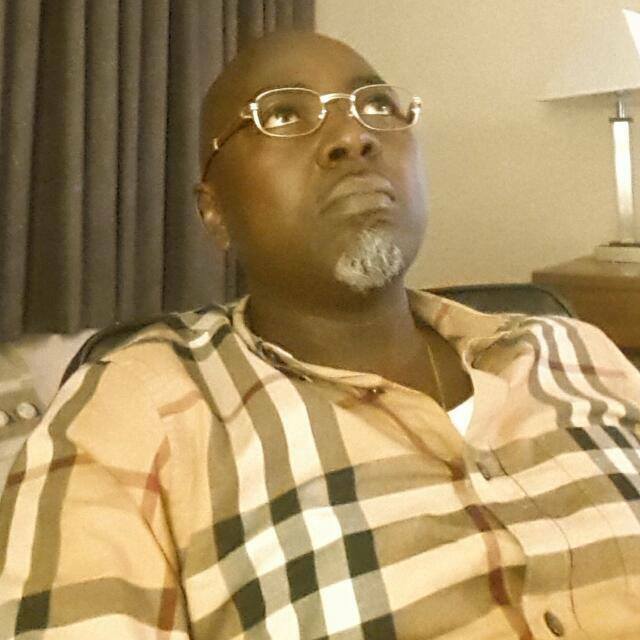 If you acknowledge the grace of God in your success then you’ll never look down on anyone no matter who they are. 10. Always consider it a HUGE privilege whenever God gives you the opportunity to minister to those in need, it’s never a loss. Such acts of love are always rewarded by God. 11. You’ve got stuffs in your home you don’t need, you’ve got things you haven’t touched in well over a year, shoes, suits, hand bags, etc. What about looking around for those your stuff can be a blessing to and just give it to them? A Nigerian actress has released sultry photos to celebrate her birthday which coincides with the Christmas season. S*xy actress Oge Aneke clocked a year yesterday, December 25th, 2016. The pretty actress decided to hit the studio for these clean photos which portrayed her in one of her best form ever. The pictures that caught the eyes of her fans were the ones that painted a bedroom setting where she wore a massive towel. The talented and beautiful actress is from Enugu State, Udi precisely, but was born in Makurdi Benue State Nigeria. The 2011 graduate of Chemical Engineering from the Institute of Management and Technology, Enugu, Started her acting career in 2013 and featured in her first movie tittled 'Obi is a boy' in 2014 by Blessed Mishack's production, which brought her to the limelight. 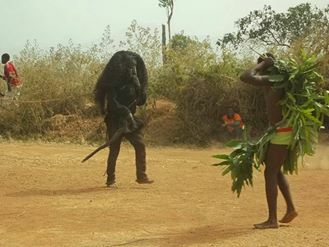 Other movies prominently starring Oge include; Old Soldier Never Dies, Black Out, Childless Widow, God Is My Witness , Osuofia Goes To School, Illuminati Kingdom, King Of Opobo ,City of Dragon, Money Works With Blood and many more. Hundreds of workers toiled endlessly to create what is now the world's tallest Christmas tree in the world. The world's tallest Christmas tree has been unveiled in Sri Lanka just in time for Christmas after four months of hard work by hundreds of helpers, Dailymail reveals. The 73-meter (238-foot) artificial tree was raised in the country's capital, Colombo, is 18 meters (59 feet) taller than the current record holder, organizers said. The tree is made of steel-and-wire frame covered with a plastic net decorated with more than 1 million natural pine cones painted red, gold, green and silver, 600,000 LED bulbs and topped by a 6-meter (20-foot)-tall shining star. The tree costs $80,000 and was criticized by the Catholic Church as a 'waste of money.' The church suggested that the funds better be spent on helping the poor. Hundreds of port workers and volunteers struggled for four months to put up the tree in time for the holidays. Work was suspended for six days in early December after Cardinal Malcolm Ranjith — representing the island nation's 1.5 million Catholics — lambasted the project. Prime Minister Ranil Wickremesinghe responded to the criticism by saying the tree was not being built with public money, but with donations from individuals and private firms. The Guinness World Records is yet to confirm if this is the tallest artificial Christmas tree. Currently, the record is held by a Chinese firm that put up a 55-meter (180-foot) tree-like tower of lights and synthetic foliage, ornaments and lamps in the city of Guangzhou last year. For almost one month now there has been a series of unrests and violence in some towns of the Northwest and Southwest Regions(1) of Cameroon occasioned by the strike of the Anglophone Lawyers and of the Teachers’ Trade Unions of the English Sub-system of Education. These have led to the loss of human life andto the destruction of property of some of our citizens. There have been flagrant abuses of human rights, as demonstrated by credible eyewitness accounts and by pictures on local television channels and social media. This has led to a premature end to the first term of the school year and paralysed the court system in these regions to the detriment of school children, students, parents and the administration of justice. At the moment, it seems that the government and the striking groups have reached an impasse and it is not likely that the schools are going to open even when the second term begins for the rest of the country. These unrests are symptomatic of a deeper unease among the inhabitants of this geographical circumscription of our nation. 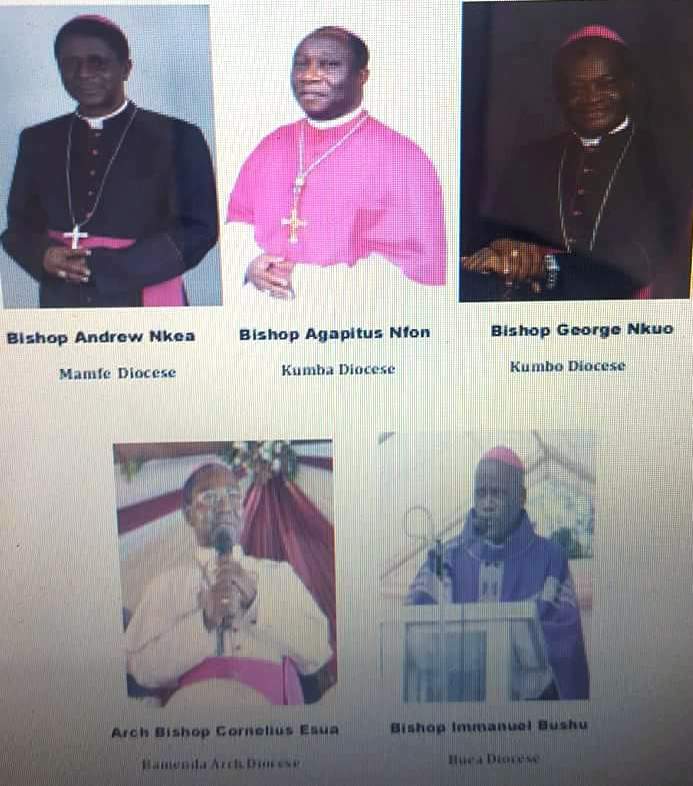 We, the Bishops of the Ecclesiastical Province of Bamenda, which is coterminous with the Northwest and Southwest Regions, where we hold responsibility as Shepherds, cannot remain indifferent to this situation. The Church,in this season, celebrates the birth of Jesus Christ, the Prince of Peace. She has as mandate to proclaim the message of peace (Luke 10:5; Matthew 5:9), and has always stood for justice and peace, and worked for the attainment of the common good of society.Because of her role and competence, the Church is not identified in any way with the political community nor bound to any political system(2). This places her in a uniquely privileged position to provide a balanced perspective on the current problem between the government of Cameroon and the population of significant segments of the Northwest and Southwest Regions of Cameroon. It is for this reason that we have presumed to seize the moment and to make the following submission, with a view to assisting the government to seek a lasting solution to this problem and enable its citizens to live in peace and harmony. Most of the territory known today as the Republic of Cameroon was a German protectorate from 1884. However, German Kamerun also included British Northern Cameroons, which elected to become part of Nigeria in the plebiscite of 1961. This protectorate was divided into British and French Cameroons in 1916 and confirmed, with some slight modifications, by the Milner-Simon Agreement of 10 July 1919. British Cameroons, which was comprised of Northern and Southern Cameroons, was one fifth and French Cameroun was four-fifths of the entire territory. They were Class B Mandated Territories of the League of Nationsuntil 1946 when they became United Nations Trust Territories. Before the London Constitutional Conferences of 1957 and 1958, three political options had emerged in British Southern Cameroons, namely independence as a separate political entity, independence in association with Nigeria, and independence by reuniting with French Cameroun. The Mamfe Conference of August 1959, which was called to hammer out consensus among Southern Cameroonians on one of the options, did not succeed to arrive at a consensus. The three political options persisted, with the most popular being independence as a separate political entity, the next being association with Nigeria and the least popular being reunification with French Cameroun. 1. Do you wish to achieve independence by joining the independent Federation of Nigeria? 2. Do you wish to achieve independence by joining the independent Republic of Cameroun? Southern Cameroonians were apprehensive of this move and put pressure on John Ngu Foncha to lead a delegation to London in November 1960 to include the option of independence as a separate political entity. The request was rejected. Nevertheless, according to United Nations Resolution 1541(XV) Principles VII and VIII, Southern Cameroons was qualified to achieve independence either through association or integration which “should be on the basis of complete equality between the peoples of the erstwhile Non-Self-Governing Territory and those of the independent country with which it is integrated. The peoples of both territories should have equal status and rights”. It was with this understanding that on the 11th of February 1961 British Southern Cameroons voted to join French Cameroun while British Northern Cameroons voted to join the Federal Republic of Nigeria. In September 1966, all the political parties went into dissolution to form one party in the Federal Republic of Cameroon (the Cameroon National Union), giving birth to one party rule. In 1968, Honourable Solomon Tandeng Muna was appointed to replace Honourable Augustine Ngom Jua without the required Parliamentary endorsement and in contravention of the law which did not permit Muna to handle the posts of Federal Vice President and Prime Minister of the State of West Cameroon concomitantly. Southern Cameroonians saw these moves as dictatorial and undemocratic. They had come from a multi-party democratic society where free debate, alliances, consensus, and respect for the Constitution were the accepted modus operandi. While West Cameroonians were still bracing themselves for life in a political dispensation which they regarded as imposed on them by circumstances beyond their control and struggling to cope with the manoeuvres of President Ahmadou Ahidjo, he proposed a Constitution that would make the Federal Republic a unitary state, the United Republic of Cameroon. As we all know, in those days it was politically unwise and even unsafe to hold and express views different from those of the President on any issue, and so there was no public debate on the constitution. This constitution was voted on in a national referendum organized and conducted by the Cameroon National Union (CNU), by now the sole political party in the Republic. The results show that the overwhelming majority of the electors in East and West Cameroon voted in favour of a unitary state. Looking back at what happened, many Anglophone Cameroonians now believe that this was the high-water mark of Ahidjo’s deceit and manipulation of West Cameroonians, and some have linked the birth of separatist movements in Anglophone Cameroon to this referendum. Three years later, the Constitution was amended to include the post of Prime Minister, appointed by the President. Following another amendment in 1979 the Prime Minister would be the constitutional successor of the President of the Republic.In 1984, a constitutional amendment changed the country’s name from the United Republic of Cameroon to the Republic of Cameroon. In the eyes of West Cameroonians, Law No 84-1 of 4 February 1984, was incontrovertible evidence that the original intentions of our Francophone brothers and sisters were to absorb Southern Cameroon and not to treat with it as equals. After thirty-threeyears of union, we had all ended up as citizens of the Republic of Cameroon or East Cameroon. It should be clear, from the brief historical sketch presented above, what the crux of the so-called Anglophone Problem is. 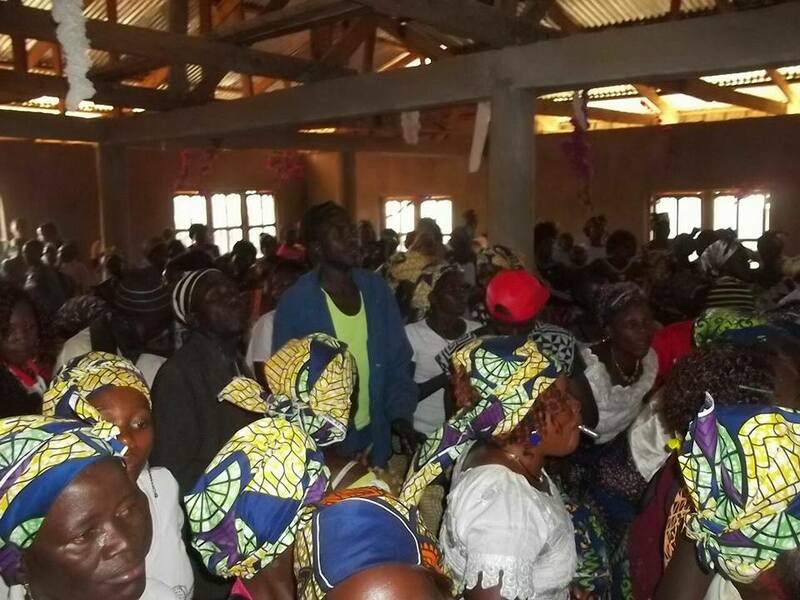 No matter what some self-appointed elite and spokespersons for Anglophone Cameroonians as well as government Ministers say in public, the participation of various strata of the population and the growing popularity of separatist movements among young and older members of the Anglophone community demonstrates that there is an Anglophone Problem. There is a consciousness among Anglophone Cameroonians that all is not well and something needs to be done about their plight. i. The failure of successive governments of Cameroon, since 1961, to respect and implement the articles of the Constitution that uphold and safeguard what British Southern Cameroons brought along to the Union in 1961.
iii. The cavalier management of the 1972 Referendum which took out the foundational element (Federalism) of the 1961 Constitution. iv. The 1984 Law amending the Constitution, which gave the country the original East Cameroon name (The Republic of Cameroon) and thereby erased the identity of the West Cameroonians from the original union. West Cameroon, which had entered the union as an equal partner, effectively ceased to exist. v. The deliberate and systematic erosion of the West Cameroon cultural identity which the 1961 Constitution sought to preserve and protect by providing for a bi-cultural federation. It is our conviction that the Anglophone Problem would have been solved, or at least mitigated, if it had been well managed by those concerned. A lack of proper management seems to be what has aggravated the problem. It is unfortunate to note that the government of Cameroon seems to have made every attempt to downplay or even deny the existence of an Anglophone Problem. 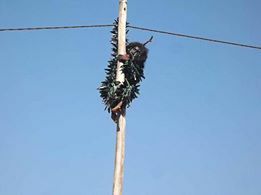 Government Ministers (even those of former West Cameroon extraction) have denied the existence of any such problem in the media and in public speeches. Furthermore, it is widely believed in Anglophone Cameroon that government has consciously created divisions among the English-speaking elite, remunerating some allies with prestigious positions in the state apparatus previously reserved for Francophones only, and repressing all actions designed to improve on the status of Anglophone Cameroonians in the union. This seems to have been proven true in the recent unrests by the utterances of government Ministers in the Press Conference on CRTV, in the dispatch of an Anglophone Elite delegation to the Northwest Region, and in the brutal suppression of protests by certain professional groups and sections of the Northwest and Southwest Regions. 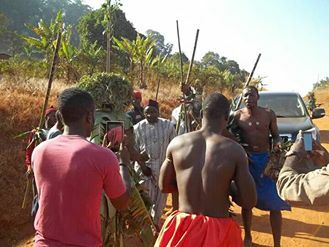 In the face of this denial of the existence of an Anglophone Problem by government and the consequent deafening silence from the government to the cries and protests of Anglophone Cameroonians, certain groups have emerged in Anglophone Cameroon that call for the secession of Anglophone from Francophone Cameroon. The Southern Cameroons Youth League, the Southern Cameroons National Council, and the Ambazonia Movement are some of the most strident of these groups and are currently members of the Unrepresented Nations and Peoples Organisation (UNPO) in The Hague. There are different forms of federalism, and federalists in Anglophone Cameroon will differ as to the specific nature of the federal state they would want. However, they are all agreed that they do require a federation which recognises and preserves the region’s peculiarity, as did the 1961 Federal Constitution. Successive amendments to the Constitution up to and including the Amendments of 1996 insist on the fact that Cameroon is one and indivisible (Article 1-2, 1996). Cameroon is described as a decentralised unitary state. Unitarists believe that everything must be done to avoid federalism or secession. However, even the decentralisation announced by the 1996 Constitution has not been implemented, and government and administration have been highly centralised. i. Anglophone Cameroonians have complained about the fact that National Entrance Examinations into Schools that develop the human resources of this country are set per the French Subsystem of Education which makes it very difficult for Anglophones and Francophones to compete on a level playing field. Majority of the membership of these Examination Boards are Francophone so that the interests of Anglophone candidates are hardly, if ever, protected. ii. Out of the five Ministries concerned with Education, which is the means of the transmission of culture, none of the Minsters is Anglophone and none even qualifies to be a deputy or Secretary of State. This gives the impression of a calculated attempt to kill Anglophone culture. iii. In human resource deployment, there is a gaping inequality in the distribution of posts of responsibility between Anglophones and Francophones. Of the 36 Ministers who defended the budgets for the Ministries last month, only one was Anglophone. In addition, there seem to be key ministries that have been reserved for Francophone Ministers only and Anglophones do not even qualify to be Secretaries of State under them. These include, but are not limited to, Defence, Finance, Territorial Administration, and Economy. iv. In the 1961 Constitution, the Vice President was the second most important personality in state protocol. Today, the Prime Minister (appointed Anglophone) is the fourth most important person in State Protocol, after the President of the Senate and the President of the National Assembly. Even so, Anglophone Cameroonians believe that he wields no real authority and, like was the case with J.N. Foncha as First National Vice President of the CPDM, finds it “impossible to use [his] exalted position to help in any way shape or influence the policies of the party and nation.”(7) There are clearly Francophone ministers who wield more power than he does. This seems to have been proven true in the last Teachers’ strike. 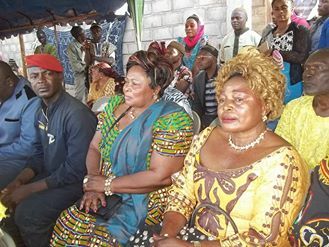 When the Prime Minister was in Bamenda negotiating with the Teachers’ Union Leaders, a group of Francophone Ministers were giving a Press Conference in Yaoundé on the same issue, giving the impression that the negotiations of the PM in Bamenda were of no consequence. There have been widespread protests about the way the English Language has been treated in the public life of the nation. i. State institutions produce documents and public notices in French, with no English translation, and expect English speaking Cameroonians to read and understand them. ii. National Entrance Examinations into some professional schools are set in French only and Anglophone candidates are expected to answer them. Sometimes this happens even in the English-speaking regions. iii. Visitors and clients to government offices are expected to express themselves in French, even in the English-speaking regions, since most of the bosses in the offices speak French and make no effort to speak English. iv. Most Senior Administrators and members of the Forces of Law and Order in the Northwest and Southwest Regions are French-speaking and make no effort to understand the cultures and customs of the people they are appointed to govern. v. Members of Inspection Teams, Missions and Facilitators for Seminars sent from the Ministries in Yaoundé to the English-speaking Regions are generally predominantly French speaking, and expect to be understood by audiences which are predominantly English speaking. vi. The Military Tribunals in the Northwest and Southwest Regions are basically French courts. vii. Basic Finance documents which businesses and other institutions are expected to work with are all in French. Examples include the COBAC Code, the CIMA Code and the OHADA Code. Apart from the fact that Ministers, Directors General, Heads of Parastatals, Senior Divisional Officers, Heads of Law Enforcement Institutions, etc. are disproportionately Francophone, there seems to have been a conscious effort made to flood the Northwest and Southwest Regions with Francophone Heads of Service. i. The Magistrates in these Regions are disproportionately Francophone. So are the Senior Divisional Officers, the Divisional Officers, Commissioners, and Commandants. In the educational sectors, there are increasingly Francophone principals posted to Anglophone schools. Personnel in Hospitals, Banks and Mobile Telephone Companies (even those which originate from Anglophone countries), are predominantly Francophone. And this extends to even non-expert workers in petrol stations. ii. The situation is aggravated by the fact that these Francophone administrators are often overbearing, very arrogant and treat people as if they were second-class citizens, and have no iota of respect for the dignity of the human person. Apart from neglect of infrastructure in the Northwest and Southwest Regions of Cameroon and the mismanagement and ruin of buoyant companies like Cameroon Bank, West Cameroon Marketing Board, WADA in Wum, West Cameroon Cooperative Movement, etc., oil revenues are alleged to be used by those in power to feed ‘the bellies’ of their allies, and to stimulate the economy in other regions. In addition, there is also great anxiety in Anglophone Cameroon that its major agro-industrial enterprises, especially the Cameroon Development Corporation (CDC) and Plantations Pamol du Cameroun Ltd (Pamol), are sold or their headquarters moved elsewhere. The flooding of state Anglophone educational and legal institutions with French-trained and French speaking Cameroonians who understand neither our educational subsystem nor the English Common Law undermines Anglophone education and legal heritage and subverts the original intentions of the founders of the nation to build a bi-cultural nation, respecting the specificity of each region. This is the cause of the current strikes by common law lawyers and teachers. The exclusion of qualified Anglophones in admissions into state professional schools (especially Schools of Administration, Medicine and Medical Sciences and Higher Teacher Training) even in the Anglophone Regions is a glaring example of marginalisation which the Teachers Unions cited. These, and many others, have led to the unease and discomfort of the people of the Northwest and Southwest Regions. They perceived this marginalisation as institutionalised as they have been labelled “Biafrans”, “enemies in the house” and “traitors” by highly placed government officials and ministers who were never reprimanded for doing so. There has been a misleading argument from some quarters where some have argued that an Anglophone is anyone who can speak English, as a way of countering Anglophone Cameroonians who protest the issues we have enumerated above. It might be helpful, for the purposes of our presentation and future discourse, to note here that ‘Anglophonism’ goes beyond the mere ability to speak or understand the English language. It speaks to a core of values, beliefs, customs, and ways of relating to the other inherited from the British who ruled this region from 1916 to 1961. ‘Anglophonism’ is a culture, a way of being which cannot be transmitted by merely learning a language. In fact, as Dr. Anthony Ndi intimates, Southern Cameroonians had “a distinctive outlook and way of life that went further than the mere fact that the educated ones among them spoke the English Language or a version of it. So, therefore, language could not even be the qualifying factor”. (8) This Anglophone identity is the reason most Southern Cameroonians who voted to join the Republic of Cameroon in 1961 did so. It was to preserve their cultural identity as a distinct people. 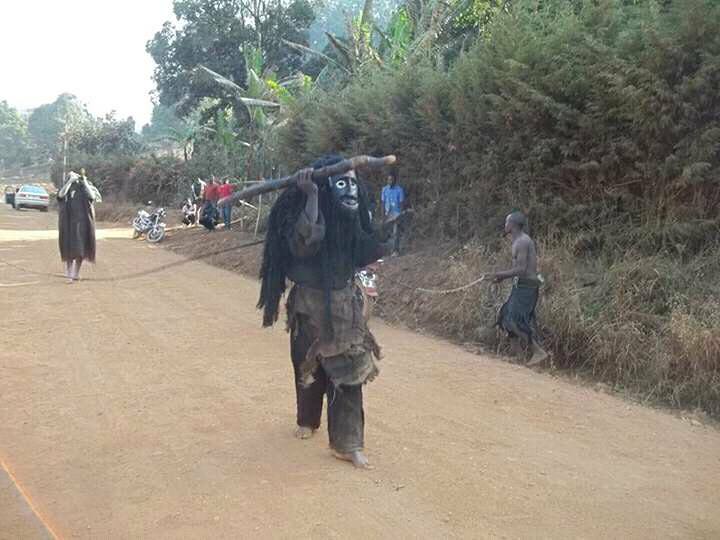 Anglophone Cameroonians are slowly being asphyxiated as every element of their culture is systematically targeted and absorbed into the Francophone Cameroon culture and way of doing things. These include the language, the educational system, the system of administration and governance (where appointed leaders are sent to lord it over people who cherish elected leaders), the legal system, and a transparent democratic process where elected leaders are answerable to the electorate who put them there in the first place. 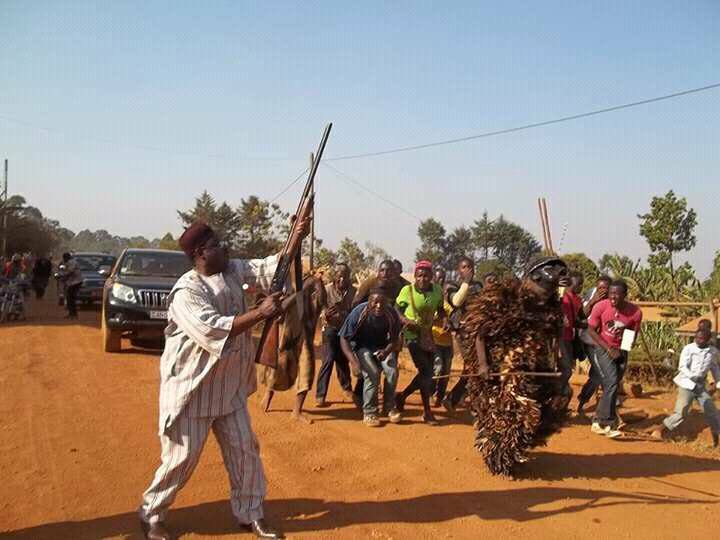 Anglophone Cameroonians have seen through this and are raising their voices in protest. 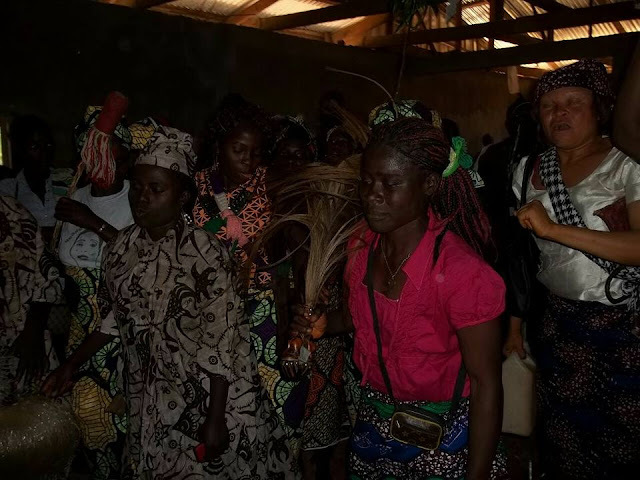 The two All Anglophone Conferences (AAC I and II) of the early 1990s, the rise and popularity of the SCNC and other secessionist voices are born of the frustration of Anglophone Cameroonians of being ignored and ridiculed for asking for what they deem to be theirs by right, namely the preservation of their culture. You would remember that, in his resignation letter from the post of first Vice President of the CPDM on the 9th of June 1990, J.N. Foncha cited in point 9 of the letter, as a reason for resigning, the fact that the constitution was “in many respects being ignored and manipulated”. This is not to say that we do not see the other side of the argument. In any polity formed bytwo or more ethnic, cultural, religious, or linguistic groups, there is bound to be a majority versus minority problem. In any such situation, the wise thing to do would be to make constitutional provisions which would protect and safeguard the existence and rights of the minority, rather than trample on them. The Church teaches that “not even the majority of a social body may violate these rights, by going against the minority, by isolating, oppressing, or exploiting it, or by attempting to annihilate it.”(10) Cameroon prides itself as a state of law. In this area, she is at one with the Church which teaches that society should be organised on the principle of the “rule of law”. This is the principle “in which the law is sovereign, and not the arbitrary will of individuals”(11) So, apart from the plethora of issues which enhance Anglophone disaffection with the union, there is the additional problem that they are a minority in that union. It is not for us to dictate to the Cameroonian people what form the government of this countryshould take or what solutions should be provided for the problems we have highlighted. The Church respects the legitimate autonomy of the democratic order and is not entitled to express preferences for this or that institutional or constitutional solution. Her contribution to the political order is precisely her vision of the dignity of the person revealed in all its fullness in the mystery of the Incarnate Word(12). That notwithstanding, we feel obliged in conscience as the religious and moral leaders in this part of the country, who exercise care over a people who are hurting, to propose the following lines of action which, hopefully, should lead to peace and harmony among our people. One of the most disingenuous things any enlightened Cameroonian, talk less of educated Cameroonian of Anglophone upbringing, can do is to deny that there is an Anglophone Problem. If former French President, Jacques Chirac, the Commonwealth, the European Union, and many others have recognised that there is an Anglophone Problem and advised that the government of Cameroon and the discontented Anglophones engage in dialogue, how can Cameroonians deny that there is a problem? To play the ostrich and bury our heads in the sand is to sow disaster for the future of the nation we all love. It is to give way to extremist tendencies in the Anglophone community born of frustration at not being listened to or understood. Is it possible that the government has not heard the cries of distress of the All Anglophone Conferences which represented a broad base of Anglophone Cameroonians? Is it possible that the government has not heard the Parent-Teacher Associations (PTA), the Common-Law Lawyers, the Teachers’ Trade Unions, Students, and others who are not only uncomfortable but are choking under the present dispensation? Is it possible for us to look this beast in the eye, confront it together and overcome it for the sake of peace and unity in our country? The government’s continued denial of any Anglophone Problem, and its determination to defend the unitary state by all available means, including repression, could lead to an escalation of Anglophone demands past a point of no return, and this is not something any responsible citizen would wish for their country. In May1993, the 65-member Anglophone Standing Committee established by the AAC submitted a draft constitution which would provide for major political, financial, and fiscal autonomy for the two federated states, for the provinces inside both, and for the communities inside each province. Theyproposed the usual separation of powers between the executive, legislative, and judiciary, and a senate and national assembly for each federated state, as well as a rotating presidency for the Federal Republic, whereby after at most two consecutive mandates of five years an Anglophone would succeed a Francophone (or vice versa). This proposal was even reiterated for each of the federated states to ensure alternation between the provinces. This would be for us a lasting solution to the irksome Anglophone Problem, and would be acceptable to the majority of Anglophone and Francophone Cameroonians. We know there is never a perfect constitution and that is the reason why constitutions are amended to make them responsive to changes in time and situation. The 1996 Constitution, even though some have had issues with sections of it, is good enough as an immediate remedy for the ‘woes’ Anglophones are listing and which make life together in this nation burdensome to them. As the second-best option, we recommend an urgent and immediate implementation of the 1996 Constitution. We recommend that all the institutions created by that constitution be put in place, and that those put in place be empowered with persons charged with rendering them functional. This would include the Regions, the Senate and, by extension, the constitutional council, administrative courts, the minor courts of accounting/auditing. It is important for Cameroonians, especially those who seek protection under the ‘rule of law’ and of the Constitution, to know that the constitution has really been deployed as a means of regulating the political process in Cameroon. It is our firm belief that if this is done immediately, it would satisfy the majority of Anglophone Cameroonians and silence the calls for secession which have characterized this period of unrest. In the short term and, because the Lawyers and Teachers Strikes have paralysed our legal and school systems, it is imperative for the government to dialogue with the Lawyers and Teachers as soon as possible and agree a possible roadmap regarding their legitimate and genuine demands. We cannot solve a problem if we are unwilling to talk to each other. In the spirit of the African family, we would expect the father of the family to find out from a hurting (even if errant) child what the problem is and what they can do to alleviate their pain and suffering. There are a good number of the problems raised by our lawyers and teachers which can be solved now and there are others which can be solved later, but we need to agree a roadmap and respect it. This will enable the Teachers’ Unions to call off the strike and permit our children, who have already lost four weeks of schooling, to return to school. Indeed, openness to dialogue and to cooperation is required of all people of good will, and in particular of individuals and groups with specific responsibilities in the areas of politics, economics and social life, at both the national and international levels(13). While it is the duty of administrative and law enforcement officers to maintain peace and order in their areas of jurisdiction, many of them have been unnecessarily overbearing and arrogant. Issuing orders and threats for teachers to return to school, for instance, is not the way to solve their problem. Further, the current unrests have shown up a very ugly and embarrassing side of our administrators and the forces of law and order. Without any provocation from the lawyers or students at the University of Buea (who carried placards saying ‘No to Violence’ and raised their hands in the air), the forces of law and order brutalized some of them so badly and so inhumanely that seeing the pictures one would have thought they came from the Stone Age. It was shameful to see law enforcement officers drag female students in the mud, spray students’ rooms with tear-gas and contaminated water, and then lock some up for days just for exercising a basic human right to make their voices heard in a peaceful manner. Our administrators and the forces of law and order need to be called to order. In the exercise of their duties for the common good of all citizens, they must never trample on the rights of those citizens and deal out subhuman treatment to them. Such behaviour contravenes the law and provides a seedbed for deep resentment which later manifests itself in very ugly ways. It is in light of this that we propose that the government should immediately withdraw the forces of law and order from the streets of the Anglophone towns to which they have been deployed, open proper investigations into any abuses of human rights by the forces of law and order, and release or charge those who have been locked up as a result of the recent unrests. In this way, we would have a better climate for the negotiations which have been proposed between the government and the teachers and lawyers. Every Anglophone group that has raised its voice in protest has chronicled a number of perceived injustices which either the group or the Anglophone community in general suffers. Again, if the government gives them a listening ear, it would become clear to all whether these perceived injustices are founded or just imaginary. As long as these people, rightly or wrongly, continue to feel that they are the victims of injustice, we cannot build ‘the Island of Peace’ in Central and West Africa we have been proclaiming that we are, and we cannot develop our country without this peace either. We do not believe, in conscience, that locking up people who speak up against injustice (real or imagined) will kill dissent and bring peace. Maybe some examples will help clarify the point we are making. On the 14th of December 1967, Martin Luther King, Jr. made a statement outside a California prison where Vietnam war protesters were being held. He said: There can be no justice without peace and there can be no peace without justice.On the World Day for Peace, 1st January 1972, Pope Paul VI had as theme for his Message: if you want peace, work for justice. These great crusaders for social justice teach us that without justice, peace will be an elusive goal. These examples show that we need to examine, in a dispassionate manner, the root causes of the unease and unrest in the Anglophone Region of Cameroon and, if these causes are connected to injustice in any form, do all we can to root out those injustices. We stated at the beginning of this Memorandum that it is our bounden duty as Shepherds of the people in the Northwest and Southwest Regions of Cameroon where there are unrests and dissatisfaction, to make a contribution to the solution of the problems that have been posed. We hope that you will find our contribution helpful as you try to navigate this very sensitive and delicate period in our nation’s history. We are aware of the gravity of your responsibility before the people of Cameroon and before History, and that is why we tried to do all we could to help. In addition, we commend you and the people of Cameroon to God in prayer, in the belief that He will give you the wisdom you need to carry out this task. We can only add that in this case, time is of the essence as some of our children have already missed school for a month. A certain religious leader is credited to have said: There really can be no peace without justice. There can be no justice without truth. And there can be no truth, unless someone rises up to tell you the truth.What we have set forth here is what we believe to be the truth, told as part of our prophetic mission, in the hope that it will bring justice, peace, and harmony to this country which we all hold dear to our hearts. May Mary, Queen of Peace, and Patroness of Cameroon, intercede for us and for our country. 1. The territory which covers the Northwest and Southwest Regions has been called various names in the History of Cameroon: British Southern Cameroons, West Cameroon, Anglophone (English-speaking) Cameroon. These names will be used in this document as appropriate to the historical period in question. 3. Ngoh, J. V., (2011:4), The Untold Story of Cameroon Reunification: 1955-1961, Limbe, Presprint Plc. 4. Mukete, V. E., 2013:419, My Odyssey: The Story of Cameroon Reunification With Authentic Letters of Key Players, Yaounde, Sopecam. 5. Ndi, A., (2013:6) Southern West Cameroon Revisited (1950-1972): Unveiling Inescapable Traps, Volume 1, Bamenda, Paul’s Press. 8. Ndi, A., (2005:249-50), Mill Hill Missionaries in Southern West Cameroon (1922-1972): Prime Partners in Nation Building, Paulines Publications Africa, Nairobi. 10. John Paul II, Centissimus Annus, No. 45. 11. John Paul II, Centissimus Annus, No. 44. 12. John Paul II, Centissimus Annus, No. 47.